County residents can weigh in at sonomacounty.ca.gov/Parks/Planning/Petaluma-Sebastopol-Trail/. READY TO ROLL All these bikes want is a day on a nice trail with a happy rider smiling as they cycle town to town. After years of planning, Sonoma County Regional Parks has just come one step closer to starting work on a proposed 15-mile bike trail that would connect the cities of Petaluma and Sebastopol. Sonoma County Regional Parks presented the Sonoma County Board of Supervisors with an extensive feasibility study on Feb. 6. 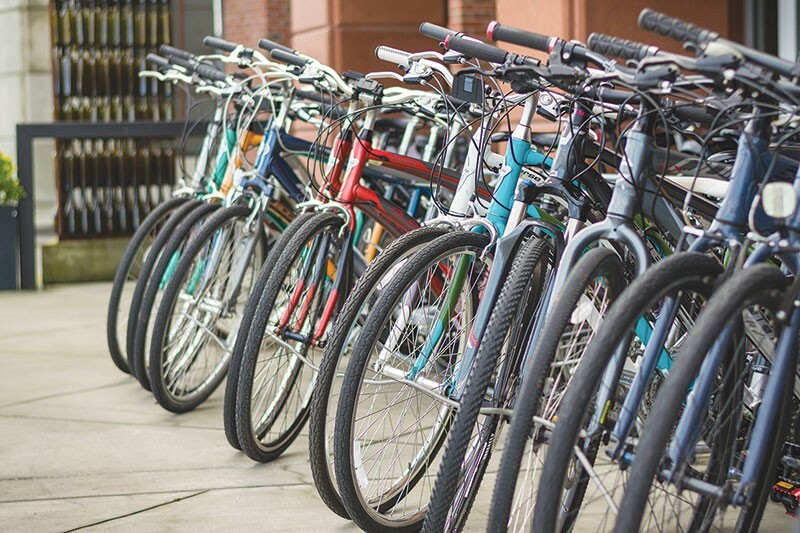 The purpose of the study was to determine the safest and most feasible route for a currently unnamed pedestrian and bike trail between the two cities, and also to consider routes to connect unincorporated areas of Sonoma County. The board accepted the findings and recommendations of the study on Feb. 13, allowing Regional Parks to receive final reimbursement and meet obligations of the grant used to pay for the study. According to a summary of the study, the ideal route for the paved trail is the corridor next to Highway 12 and Stony Point Road. However, according to Fifth District Supervisor Linda Hopkins, there is some debate between those who want the trail to follow the highway and others who want it elsewhere. Hopkins says she enthusiastically approves of the bike trail. She says West County is already underserved by alternate transportation options, as the SMART train does not go to that area. Furthermore, West County is more rural than other parts of the county, and has no bike lanes in several areas, even as it boasts a vibrant bicycling community. Besides the safety of cyclists and pedestrians, Hopkins says there are matters of health and community as well that play into the push for additional options for cyclists. The report takes special note of the many advantages of alternate transportation routes around the county—ranging from encouraging exercise to creating more opportunities for recreation, to preserving and creating more open spaces. Regional Parks recommends further studies on the environment, boundary surveys, geotechnical investigations and detailed engineering and design further down the line before the project can truly get off the ground. "It's good for the body," Hopkins says, "and it's good for the planet. What's not to love?" For bike enthusiasts, what's not to love is the delay in building the path. Actual construction is a long way off (decades, even). Hopkins says the study gave a basic primer to the best route, but that a lot more work and research is needed. She likens the eventual rollout of the bike path to reading a book, and this study is merely the prologue. According to Hopkins, Regional Parks has not yet seriously discussed the potential cost of the project, or where the funding will come from. Sonoma County estimates the total cost of the project at approximately $33.5 million. Hopkins says she hopes the local Sonoma County Transportation Authority and the California Department of Transportation will provide grants to build the trail when the time comes—as California Transit already did to pay for the study. But such grants are incredibly competitive, Hopkins warns. Other options she suggests are passing a local measure to cover costs. According to the Sonoma County website, the trail is planned to be constructed in phases, depending on how much funding becomes available. The process of finding an ideal route included local officials seeking input from Petaluma and Sebastopol shareholders and representatives, as well as citizens of both areas. Regional Parks conducted three public meetings as an online survey to make sure the public's voice was heard, and held several meetings with city authorities from Petaluma and Sebastopol. West County already has several bike trails that connect its disparate cities, such as the West County Regional Trail that connects Forestville, Graton and Sebastopol, and the Joe Rodota Trail that links downtown Santa Rosa to Sebastopol. But there's no trail that links Petaluma to Sebastopol. According to the summary, if and when the proposed trail is completed, it would contain links to these and other bicycle and pedestrian trails both existing and planned for the future, such as the Laguna de Santa Rosa Trail and the SMART multi-use pathway. The proposed bike trail was first conceived in 2010 as part of the Sonoma County Bicycle and Pedestrian Plan, and got its inspiration from the route taken by the former Petaluma Sebastopol Railroad. But much of the right-of-way for the railroad has either gone under private ownership or developed for other reasons. In 2015, the Bohemian reported on the feasibility study when it was first proposed in a news article that highlighted the difficulty in building a bike trail in areas with extensive residential development and unclear lines of property ownership along the rail-bed, and also noted the not-insignificant fact that part of the rail bed to be repurposed as a bike trail is currently buried under Highway 116. The study was introduced in the spring of 2016 to find a new route between the two cities while negotiating various issues (some bike enthusiasts have balked at having a bike trail run alongside a heavily trafficked highway), and was concluded last month at a cost of $248,000. A California Transit grant provided $209,436; the remaining $38,000 was paid by a local match from several sources, including the cities of Petaluma and Sebastopol, and the Sonoma County Bicycle Coalition. The study covered 13 miles of proposed trail in unincorporated areas of Sonoma County, as well as one mile each in the cities of Petaluma and Sebastopol.